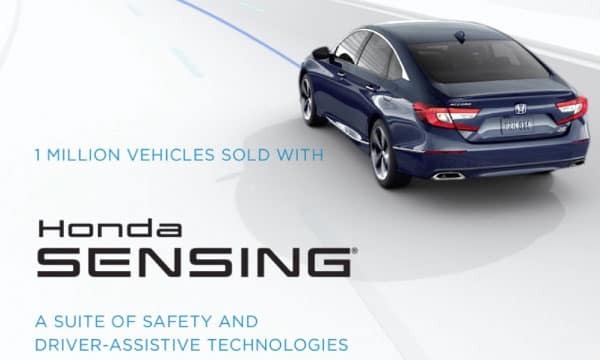 • Honda plans to achieve 95% automatic emergency braking in 2020, two years ahead of the industry voluntary commitment Marking a major milestone in its history of safety leadership and innovation, Honda today announced U.S. sales of vehicles equipped with the Honda Sensing™ suite of advanced safety and driver-assistive technologies has reached the one-million mark. Honda also will have standard Honda Sensing across the entire lineup by the 2022 model year. In addition, the Insurance Institute for Highway Safety (IIHS), an independent, nonprofit organization dedicated to reducing deaths, injuries and property damage from motor vehicle crashes, together with the Highway Loss Data Institute (HLDI), which publishes scientific studies of insurance data, issued a study on the effectiveness of Honda Sensing that determined its application resulted in significant reductions in collision claim severity, claim rates for damage to other vehicles or other property, and claim rates for injuries to people in other vehicles or others on the road. 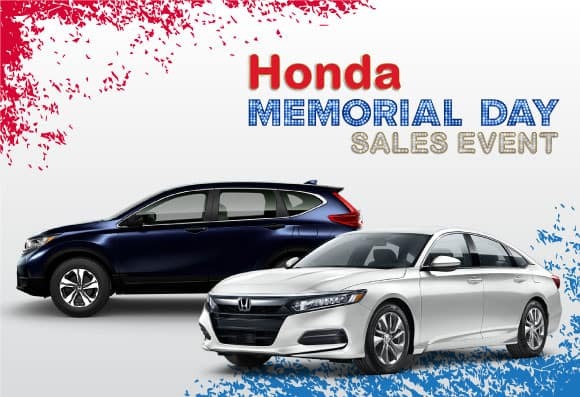 Honda Memorial Day Sales Event! Summer is here! Get the dirt and grime off your vehicle! 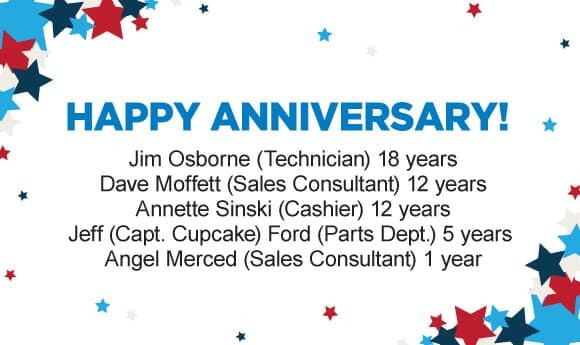 Council of Sales Leadership.Honda recognizes Sales Consultants who exemplify leadership and commitment to the Honda Brand. To attain one of these membership levels, they had to fulfill training requirements, meet sales objectives and surpass the required Sales and Delivery score. A number of events are planned for May 28, 2018 to commemorate Memorial Day. Please see below for the events happening around Rochester. –The town of Webster holds its community-wide Memorial Day service starting at 9:30 with its annual parade, beginning at Spry Middle School and ending at the Webster Rural Cemetary. State Senator Mike Nozzolio will speak at the service honoring the nation’s servicemen and women. –The Town of Greece will hold a ceremony at 10am at the Flotilla at Braddock Bay Marina. That’s followed at 2pm by the Annual Memorial Day Parade. It starts on Janes Road, runs south on Long Pond and ends at Greece Town Hall. A ceremony will follow. Greece Town Supervisor John Auberger says it’s an opportunity to honor the men and women who have made the supreme sacrifices for the liberties we enjoy, and it’s imperative we remember those who are currently in harm’s way. –The town of Pittsford holds its annual parade, starting at Sutherland High school at 10am. Ceremonies follow at the Pittsford Ceremony. –The City of Rochester will hold its annual Memorial Day Parade to honor the armed forces and those who have given their lives serving their country. The parade starts at 10:30 at East Ave. and Alexander Street, then marches west onto Main Street, ending at Plymouth Ave and West Main. –The veterans of the Battle of the Bulge will gather at Ontario Beach Park at 11am. They’ll also march in the parade in the town of Greece. Members of the group say this may be the last year they’ll be in the parade because their ranks are thinning, and most are between 86 and 96 years old. –The Vietnam Veterans of America, Chapter 20, will conduct their annual Memorial Day Ceremony at the Vietnam Veterans Memorial in Highland Park. The ceremony starts at 1pm. –The Canandaigua VA Medical Center holds its annual Memorial Day Observance. Ceremonies start at 2pm at 400 Fort Hill Avenue in Canandaigua. 1. Heat oven to 350°F. Generously spray 12-cup fluted tube cake pan with baking spray with flour. 2. In large bowl, beat cake mix, water, oil and eggs with electric mixer on medium speed 2 minutes, scraping bowl occasionally. In small bowl, place 1 cup of the batter; stir in 1 teaspoon of the red food color until blended. In another small bowl, place 1 cup of the batter; stir in 1 teaspoon of the blue food color until blended. 4. Bake 40 to 45 minutes or until toothpick inserted in center comes out clean. Remove cake from oven. Let stand 10 minutes, remove from pan to cooling rack. Cool completely, about 1 hour. 5. Place cake on cooling rack over waxed paper or cooking parchment paper. In small microwavable bowl, place 1/4 cup of the frosting. Microwave uncovered on High 10 to 15 seconds or until thin enough to drizzle over cake. 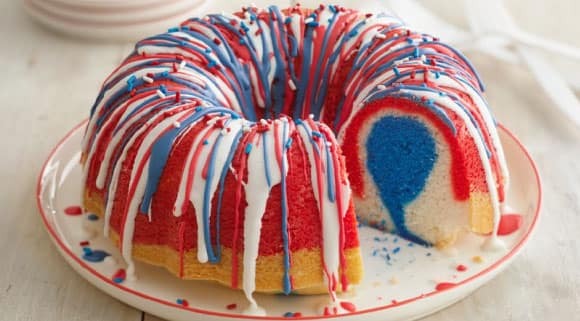 With spoon, drizzle warmed frosting back and forth over cake in striping pattern. Divide remaining frosting between 2 small microwavable bowls. To 1 bowl, stir in 1/4 teaspoon red food color until well blended. Microwave uncovered on High 5 to 10 seconds or until thin enough to drizzle. Drizzle over cake. Repeat with remaining bowl of frosting and 1/4 teaspoon blue food color. Sprinkle candy sprinkles on top. Let stand about 30 minutes or until frosting is set. Store loosely covered at room temperature.